Riding the Rigi railway going up, up, up to the "Rigi State of Mind"
It is best to contemplate Mount Rigi as a state of mind or an attitude, rather than simply a destination or check mark on a list. The Queen of the Mountains is a massive berg with Europe's first ever alpine cog railway stopping at a couple hamlets along the route and eventually arriving at Rigi Kulm, a 200 year old Belle Époque hotel and restaurant with an exhilarating panoramic view. Even in present day, summiting the Rigi is a marathon (rather than a sprint) adventure. You can hike, board the Rigi Railway, ascend by the Rigi cable car or combine all three. Regardless of your mode of transport, you will probably begin with a 1 hour boat ride on Lake Lucerne (Vierwaldstättersee) to Vitznau and from there, you go up, up, up. 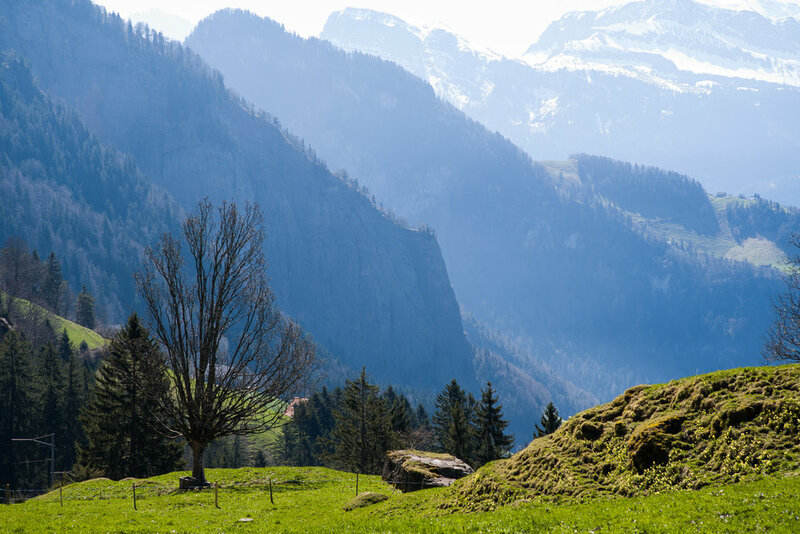 Therefore, it's best to relax, enjoy the experience and cultivate a Rigi state of mind simply by reveling in the natural beauty as you ascend upwards. Upon arriving at Rigi Kaltbad, our gemütlich Airbnb host, Marriane greeted us with a joyful face. She is as kind as a person can be. Born and raised on the Rigi, Marriane is one of the few Rigi natives. She was the only girl in a class of 5 during elementary school and being the only girl required sturdy determination. Mental and physical toughness is exactly what is required to live a life in the high alps. Mark Twain describes the Rigi as “an imposing Alpine mass, six thousand feet high, which stands by itself, and commands a mighty prospect of blue lakes, green valleys and snowy mountains — a compact and magnificent picture three hundred miles in circumference.” His 3 day climb (which he believes will take only 3 hours!) 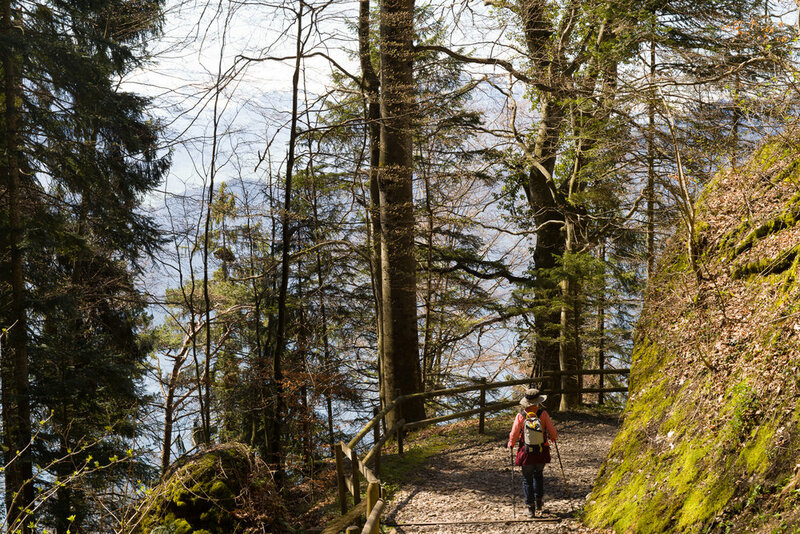 and humorous writing about his alpine journey are commemorated by the Mark Twain Trail which is a 1,350 meter ascent starting at Weggis and ending at Rigi Kulm. Even though the Rigi only reaches about 6,000 ft, it is about as steep the famous Barr Trail on Colorado’s 14,000-foot Pikes Peak. The first two hours on Twain’s trail include a punishing uphill climb via rutted paths and an improvised, earthen, zigzag staircase. Kaltbad ("cold bath" in German) is where the water from an ancient spring spews through a crack of archaic stone. For centuries through present day, devotees believe the spring water contains healing qualities, much like Lourdes in France. Marriane explained that the stone is from a primeval riverbed. Upon examination, you see a conglomerate of smooth stones due to water flowing over them for eons. She explained the river's spirit infuses energy into the stone and this force, this ancient flowing water energy, is in the spring water. Perhaps this is why some claim the water has been and continues to be a source for renewal, health and vitality. Located next to the spring is St Michael's Chapel in the Rocks which is freely accessible and always open. Barely a day goes by without someone coming to the chapel to light a candle and pray about their most pressing concerns. Inside are paintings of people who claim they were cured by the water. Images of miracles. We drank some of the water. Miracles are helpful to everyone, not just the sick. Presently, the Kaltbad spring water flows into the Minderalbad and Spa or "mineral garden" designed by Mario Botta. Unfortunately it was closed during our visit but is open during the summer and fall. The spa is illuminated by huge skylights and windows with glorious alpine views. From May through September, guests can night bathe by candlelight! The baths are heated with a log wood boiler using wood from the Rigi forests. The rich and famous trekked to the Rigi. Mark Twain chronicled his hilarious journey in Chapter XXVIII in A Tramp Abroad. In 1868 Queen Victoria also "climbed" to the Rigi Külm. She was actually carried up in a chair! Thousands of people have made a pilgrimage to Rigi Kaltbad and Rigi Kulm for health and personal reasons. The Rigi is the first of the Swiss alps. You need to arrive at the summit to realize that it truly is the first peak. Look to the north and you see miles and miles of lakes and green pasture lands. Turn around to the south and you see snow covered peaks and glacier fields along the Swiss alpine skyline. Marianne explained that Rigi energy radiates from being the first mountain and also from the water as this peak is surrounded by the blue water of Vierwaldstättersee which translates to the Lake of the Four Forested Settlements. In winter the Rigi is a ski and snowboard playground. It is also a popular jumping off point for paragliders when the weather cooperates. We rode a cable car with a couple adventurous paragliders who leaped into the sky and soared like birds for about 30 minutes. Hiking requires provisions and you buy those at Kornel's shop which is a 1 minute walk from the Rigi Kaltbad train station. Look for the sign that says, "We don't have wifi, talk to each other!" and you have found the market. Kornel is another friendly Rigian who is pleased to assist visitors in every possible way. If you are planning a big hike, best to check with a local, like Kornel, who has intimate knowledge of the mountain and insider tips to make your hike more pleasant. Be sure to give him our best! The hike from Rigi Kaltbad down to Weggis descends 3500 ft and takes about 2 .5 hours. The trail traverses through forest and pasture land. We paused at a Buddhist retreat center about half way down and enjoyed self-serve espresso while admiring the amazing view and taking in the sound of clinking cow bells. Mark Twain also paused at this very spot. Along the way signs are posted honoring famous visitors who hiked the same path. On a different day, we hiked to the summit of Rigi Kulm and then took the cogged railway to the small village of Kräbel. There is a cable car in Kräbel which we rode to the Rigi Scheidegg summit and enjoyed a warm bowl of soup before hiking (including a few manageable patches of snow) back to Rigi Kaltbad. There are miles and miles of hiking (and plenty of biking) trails to explore. Each stop along the way provides unique and beautiful views. Hike on the sunny days. 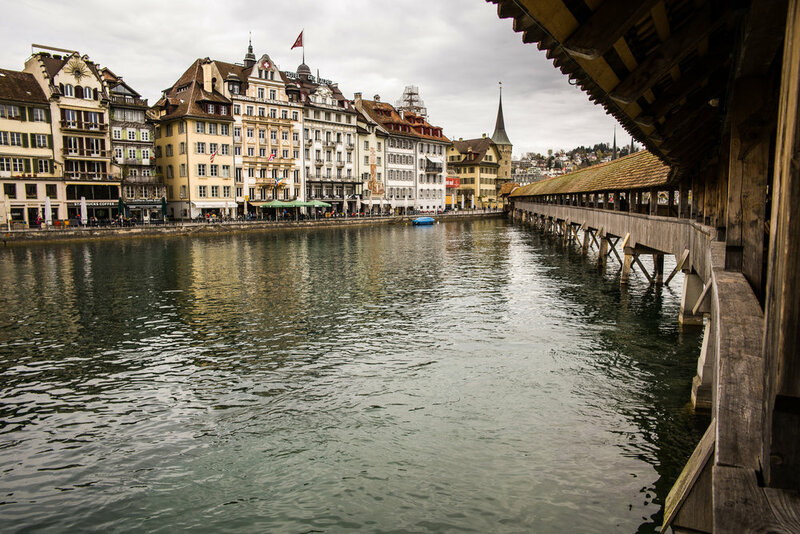 On a rainy day, a visit to Lucerne is only a train and a boat ride away and makes for a pleasant day trip. The Lucerne boat harbor is located next to the train station in the city center. Credit to the practical Swiss for city planning. 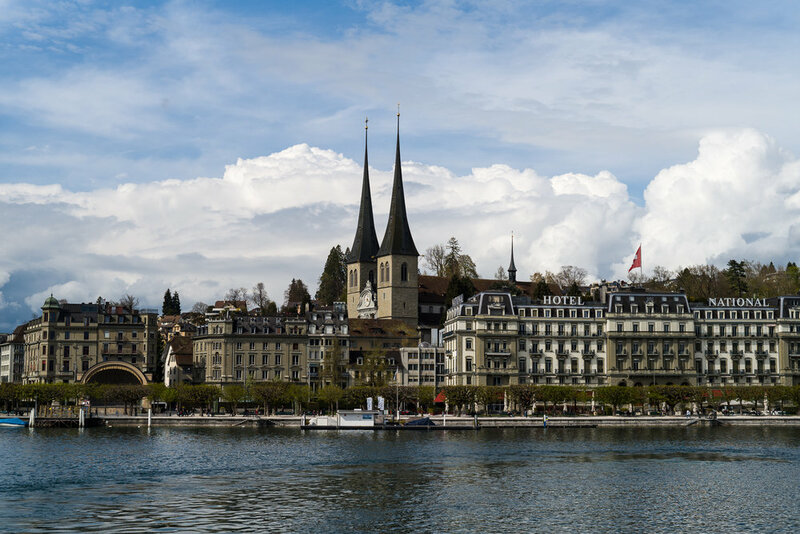 Twain rested in Lucerne before climbing the Rigi. He stayed at the historic Switzerhof Hotel with beautiful pink marble columns. It is easy to imagine Mark Twain and Queen Victoria entering the grand lobby. 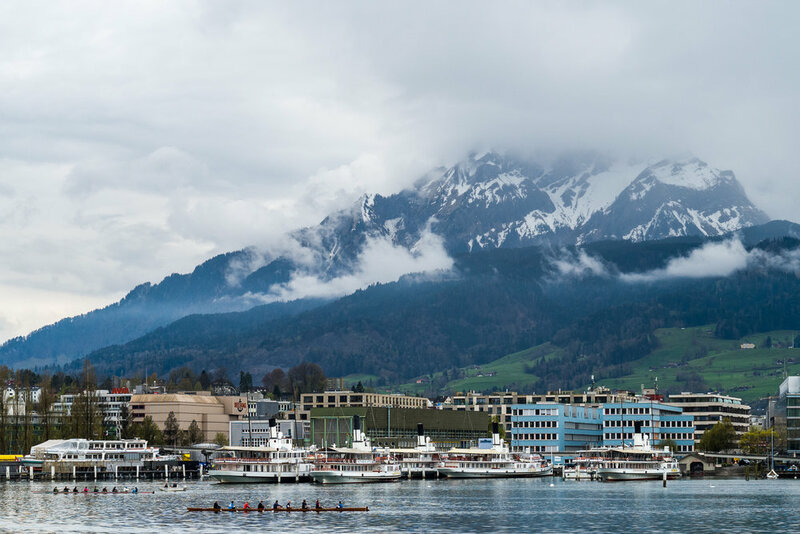 This majestic hotel has a terrace bar overlooking the water where you can watch the boats and crew teams rowing with snow covered peaks in the background. 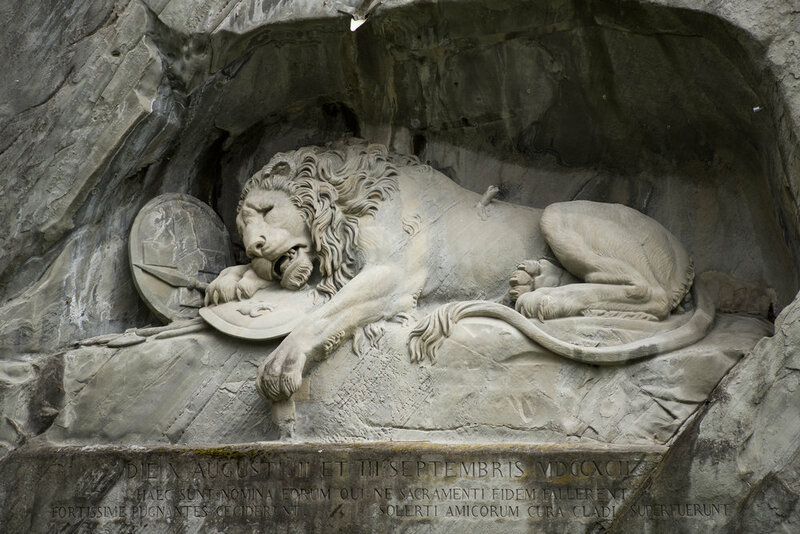 Mark Twain wrote of a tragic memorial named the Lion of Lucerne. 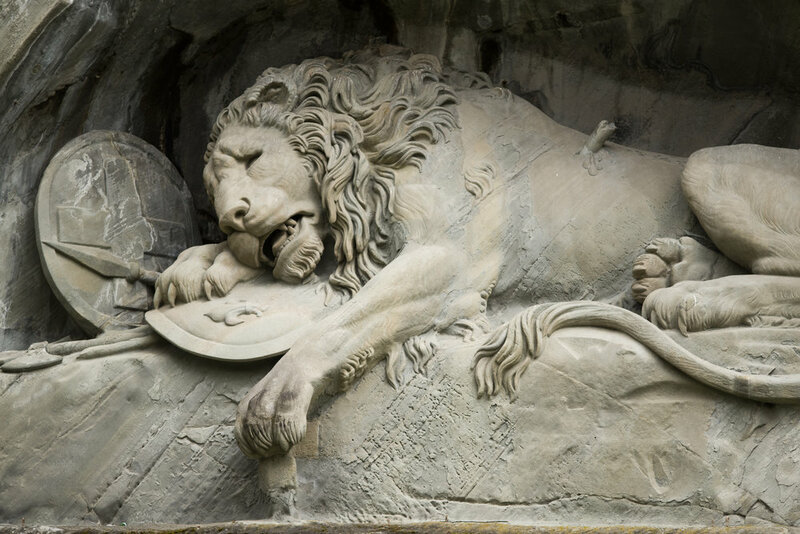 The Lion is a memorial to the Swiss Guard who died protecting the unfit king during the French Revolution. The mob clamored for the head of King Louis XVI who didn't have the strength to lead. He cowered in his palace while the crowds pounded on the castle doors. Louis ordered the Swiss Guard to defend the royal family and "not spill a drop of sacred French blood" of the red capped mob. Following the king's orders proved to be their death sentence. Twain solemn words about the Lion, "The shape is right, the attitude is right, the proportions are right, but that indescribable something which makes the Lion of Lucerne the most mournful and moving piece of stone in the world, is wanting." We had to see it. Twain was right because this is an evocative piece of stone. It resides on a cliff overlooking a tranquil pond. A moment with the Lion is a moment to reflect on all the brave men and women who died protecting an unfit leader. Wars of futility litter human history. You may want to read Twain's words on the Lion. His piece is short and poignant. It is easy to spend a couple hours exploring the old town, traversing ancient rampart walls and towers as well as walking over both bridges. 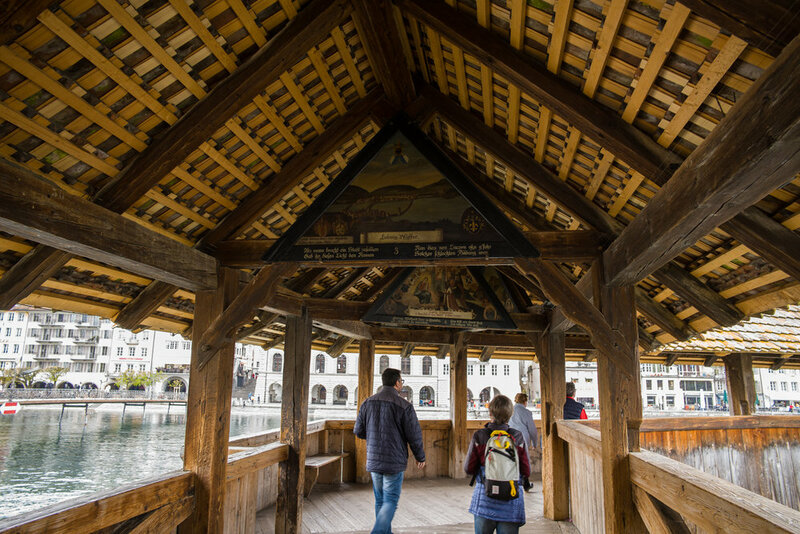 The 2 wooden covered bridges spann the Reuss River that snakes through Lucerne. The Kapellbrücke or Chapel Bridge and the Water Tower (once a dungeon) were originally built in the 1300's. As you walk through the 200 meter Kapellbrücke look up and notice the panels below the roof. These paintings were created during the Counter Reformation in the 1600's by local Catholic painter, Hans Heinrich Wägmann and depict events from town's history. Sadly, the bridge was damaged by a fire in 1993. Some paintings were saved, some restored and some are still charred black serving as a reminder of the fire caused by a careless smoker. If you like chocolate, a "must visit" is Max Cholocaltier which features 100% handmade chocolates. This family run business opened in 2009. We love chocolate and the creations of Max Chocolatier are some of the best. The Château Guetsch is perched on a hillside overlooking the town. This castle hotel has a terrace bar and restaurant providing a panoramic view. The journey to and from Lucerne provides time to think and reflect. Put your smart phone down and immerse yourself in the stunning views that surround you. Daydream and allow your mind wander. Cultivate a Rigi state of mind. The experience of Rigi is consuming and unique. Time has a different quality on the Rigi, future and past are hidden by the alertness of the present. The beauty is bold. The effort required to summit the Rigi is a filter that concentrates like minded souls who seek adventure and natural beauty. In The Tourist Hotel, Twain describes the Rigi better that anyone, "In a moment we were deeply absorbed in the marvel before us, and dead to everything else. The great cloud-barred disk of the sun stood just above a limitless expanse of tossing white-caps--so to speak--a billowy chaos of massy mountain domes and peaks draped in imperishable snow, and flooded with an opaline glory of changing and dissolving splendors, while through rifts in a black cloud-bank above the sun, radiating lances of diamond dust shot to the zenith. The cloven valleys of the lower world swam in a tinted mist which veiled the ruggedness of their crags and ribs and ragged forests, and turned all the forbidding region into a soft and rich and sensuous paradise. We could not speak. We could hardly breathe. We could only gaze in drunken ecstasy and drink in it." Don't come to the Rigi if you crave clubs, theaters, crowds or wifi...because you will not find these distractions here. Visit the Rigi if you want to deeply experience life in the present moment. Fill your days on the Rigi with activities you enjoy. Nights are peaceful and quiet. 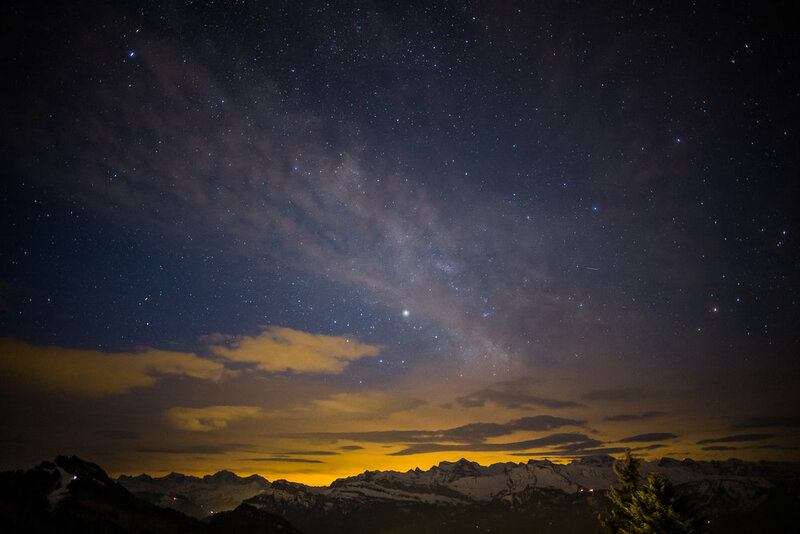 And don't forget to step outside, feel the cool alpine air on your face and enjoy the dark sky full of shooting stars. After a couple days on the mountain, you settle in and the Rigi becomes a state of mind.